This is a two bedroomed modern second floor apartment positioned in this beautiful Chapel conversion. The property has internal accommodation to comprise of a Shared Entrance Area with stairs leading to the apartment, an Inner Hallway, Two Bedrooms, Bathroom and an Open Plan Living Kitchen Area with Integrated Appliances. There are two allocated parking space. Viewing of the property is recommended. The property is ideally suited for a first time buyer or property investor. LOCATION Located to the south of Lincoln on Newark Road. The property is within easy access to the usual High Street shops and department stores, plus banking and allied facilities, multiplex cinema, Marina and Art Gallery. The famous Steep Hill leads to the Uphill area of Lincoln and the Bailgate, with its quaint boutiques and bistros, the Castle, Cathedral and renowned Bishop Grosseteste College. Ground Rent £30 pcm – which is paid quarterly and includes buildings insurance and building maintenance. COMMUNAL ENTRANCE With stairs to the third floor. INNER HALLWAY With wooden flooring and doors to the two bedrooms, bathroom and living dining kitchen. BEDROOM 1 10′ 4" x 9′ 6" (3.15m x 2.9m) , with Velux window to the rear aspect, radiator and fitted wardrobes. BEDROOM 2 9′ 6" x 10′ 10" (2.9m x 3.3m) , with Velux window to the rear aspect and radiator. 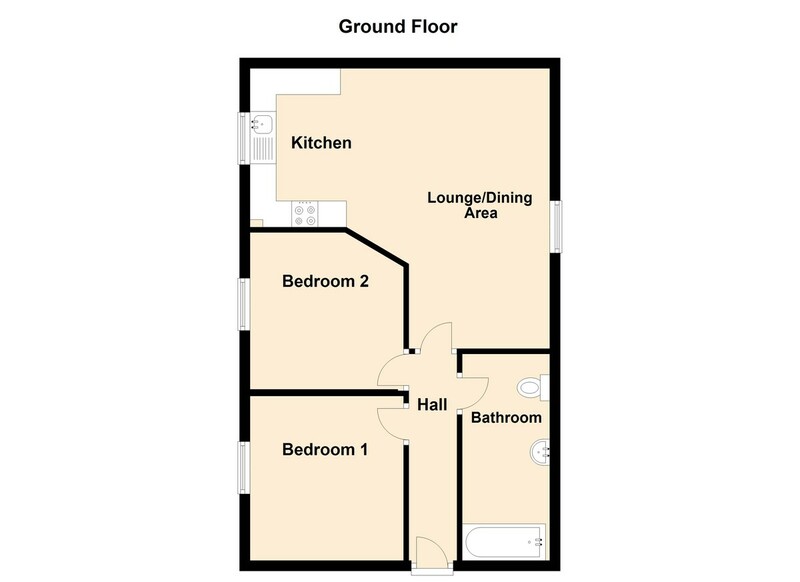 BATHROOM 5′ 1" x 10′ 4" (1.55m x 3.15m) , with Velux window to the front aspect, suite to comprise of bath with shower over, WC and wash hand basin, radiator and partly tiled walls. LOUNGE DINING AREA 17′ 5" x 8′ 4" (5.31m x 2.54m) , with Velux window to the front aspect, wooden flooring, radiator, space for dining room table and leading to the kitchen. KITCHEN AREA 10′ 1" x 8′ 1" (3.07m x 2.46m) , with Velux window to the rear aspect, wooden flooring, fitted with a range of base units and drawers with work surfaces over, stainless steel sink unit and drainer with mixer tap above, integral dishwasher, integral oven, four ring gas hob with extraction above, a fridge freezer and an automatic washing machine (included in the sale), wall mounted units with complementary splashbacks and a wall mounted gas fired central heating boiler. OUTSIDE There are two allocated parking spaces.